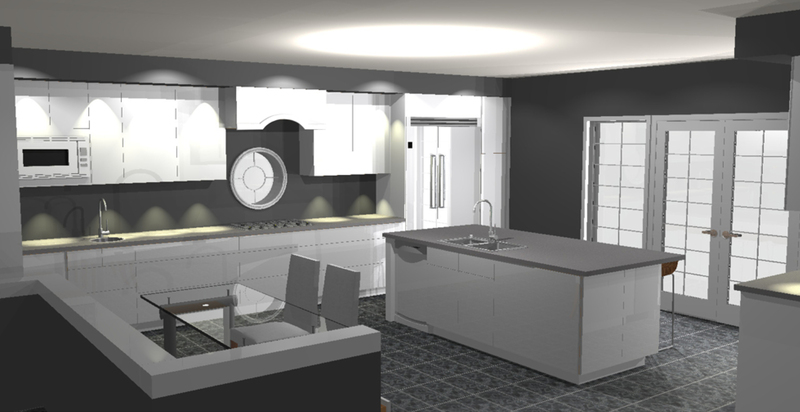 20-20 Kitchen Design. Designed, sold and exported to Bermuda on 18/02/2015 by Jordan Mayne – This was a complex kitchen as we were combining a number of product to achieve a wet look white finish while trying to stay within a specific budget. We combined European Laminate doors with a wet look polyester plywood cabinet box. We custom covered various components including the top of a stairway half wall, toe lick and various other accents to match in a rolled wet look laminate. We custom designed and fitted the range hood to fit around a round window. This was quite the challenge as we had to make sure that all the various finishes and materials from different manufacturers matched in colour, texture and sheen.